New Zealanders and the artist will place 59,000 red metal discs with their messages and their names to create The Giant Poppy Art installation for the WW1 100 year Anniversary. Everyone will be able to participate from all over the country and the world by going online. Also by personally visiting the Auckland Domain where the Poppy will be built over nine days before Anzac Day - April 16 to 24. The 59,000 red metal discs symbolise the number of New Zealand men and women who were wounded or killed in WW1. People in Auckland will be able to come to the Domain, and in return for giving a donation to support the RSA they will receive a disc. They can then write a personal message on the disc and place it as part of the Poppy build. 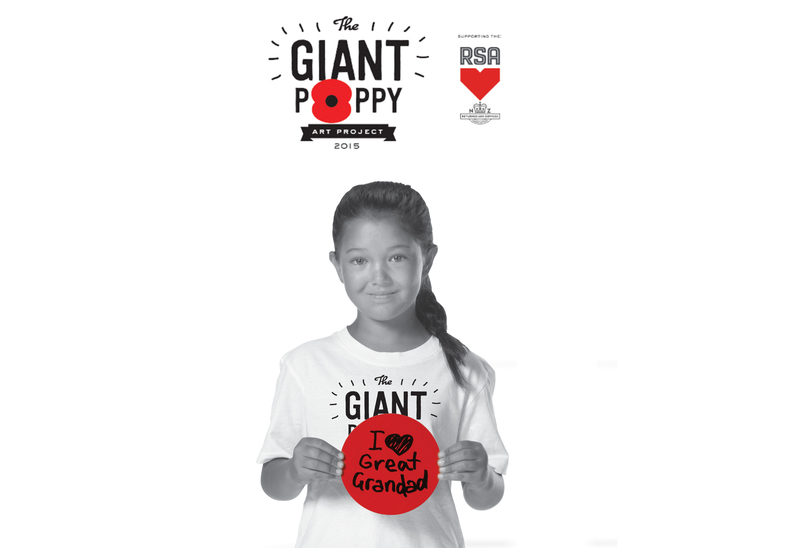 People outside of Auckland or overseas will be able to donate to support the RSA online via www.giantpoppy.co.nz and a disc will be placed on their behalf. All funds from obtaining and placing the discs whether at the Domain or online, support the RSA.
" I want all New Zealanders to make the Poppy their own, to use it to express their personal gratitude to those who protected our democracy and freedom," said artist and creator Tony McNeight of The Big Poppy Art Project. "At previous Anzac Day events I have always wanted to lay my own wreath and this installation is my modern take on paying respect." Tony had an epiphany at the Anzac Day Dawn Parade in 2014. He had always attended the Dawn Service to pay his respects. His father was in WW2 and his Great Uncle died in France in WW1. "My multi national colleagues also planted the seed when I realized they had no idea about Anzac Day and what it symbolised," explained Tony. "Some of them came from countries where freedom and democracy is not a given and I believed an installation such as this would highlight those rights we take for granted and acknowledge those who protected them." After Anzac Day last year Tony approached New Zealand Steel to make the discs and they immediately came on board with the metal discs and seed funding. "We were moved by Tony McNeight's vision and passion for this project and welcomed the opportunity to be part of it", says Margaret Gracie, VP People & External Affairs, New Zealand Steel. "This will be a high profile event for New Zealanders and will be seen across the world. With recent global events, it's important we don't take our freedom for granted and we remember the ANZACs who fought for it". The support of New Zealand Steel made Tony believe it was possible to make the Giant Poppy happen although there was still a long way to go with funding. To create the Poppy requires an investment of over $300,000 in funds and he needed to find a place for the Poppy to be built. Tony is personally underwriting the art project but is now finding that as organisations and individuals understand his vision, generous supporters are coming on board. Another major step was the support of the RSA. National President, BJ Clark, said they were excited to see remembrance being embraced on such a large scale. "The Poppy will not only be the largest in size, it will also be the largest in heart - containing 59,000 messages of remembrance and supporting our Kiwi ex-service and servicemen and women," said Mr Clark. The Auckland City Council has now given the permission for the Poppy to grow on the sports grounds below the Domain. As this is an artwork Tony and his team will continue placing discs over the nine days until all 59,000 complete the Poppy. Visitors to the Domain will place their own discs and the artist's team will place others in the name of those who donate online.
" Although I was not influenced by the Poppy installation in London, as my inspiration occurred before I knew it existed, I was encouraged by the overwhelming response it had and it is my sincere hope that New Zealanders will also embrace and respond to this project which allows for total participation."